Can you smell it in the air? Maybe you notice it when you walk into any store this time of year. The holidays are upon us. There’s no slowing down now! I know the holidays can be totally hectic if you let them – but I’ve been getting so much better with planning ahead of time that I actually look forward to the whirlwind of friends and family visits that happen between November and December. It’s always easier going to places when you know you have a game plan. Now that I’m no longer a kid, it’s not acceptable to show up to a family gathering empty handed. Even if the hostess says she doesn’t need anything, it’s always courteous to bring a little something to show your appreciation for all their hard work. During the rest of the year, I might show up with a bottle of wine, a batch of brownies or some other little treat. This time of year is the prime time to bring along a collection of your favorite cookies for the hostess. Who doesn’t love cookies?! My mom instilled in my sisters and I a deep love for holiday cookie baking. Every year we look forward to gathering together and baking endless batches of cookies. 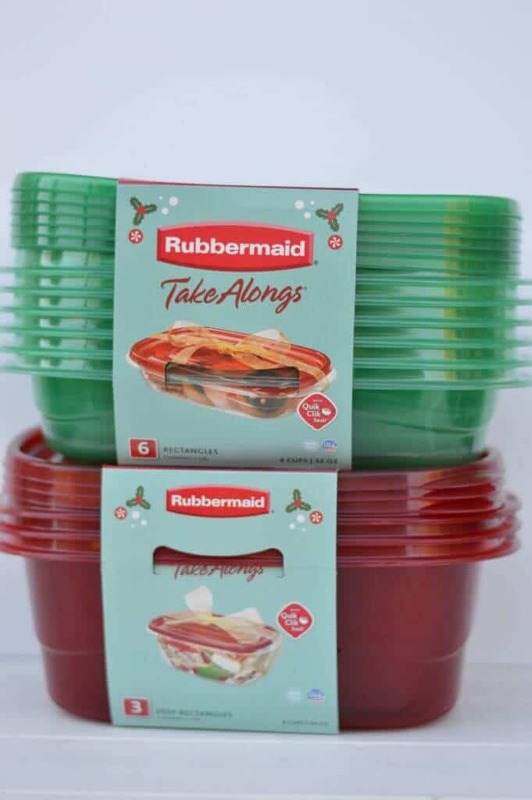 This year, we’re going to love packing them up in these festive holiday red and green Rubbermaid TakeAlongs! Today I’m going to give you the rundown on how easy it is to create a classy hostess gift that your hostess will love and proudly display (until she digs into the cookie container, of course!) For this tutorial, you’re going to need a few simple items that you may even have on hand already. 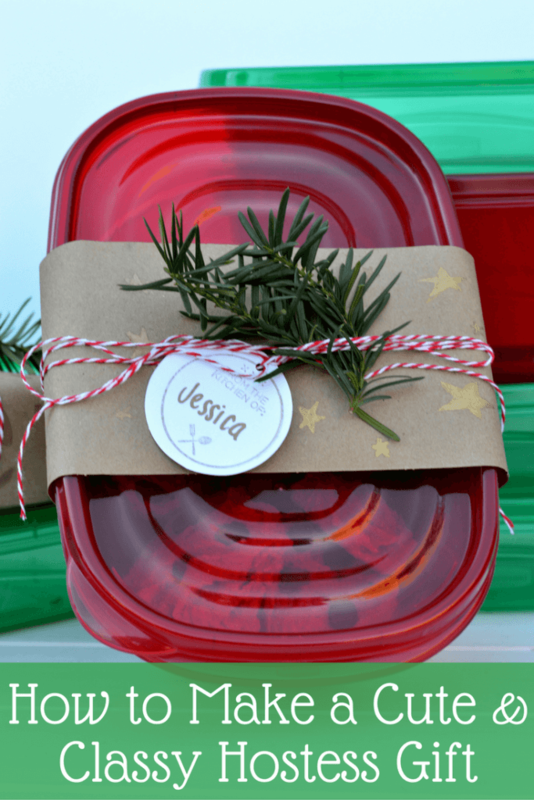 I started with these festive holiday green and red Rubbermaid TakeAlongs. 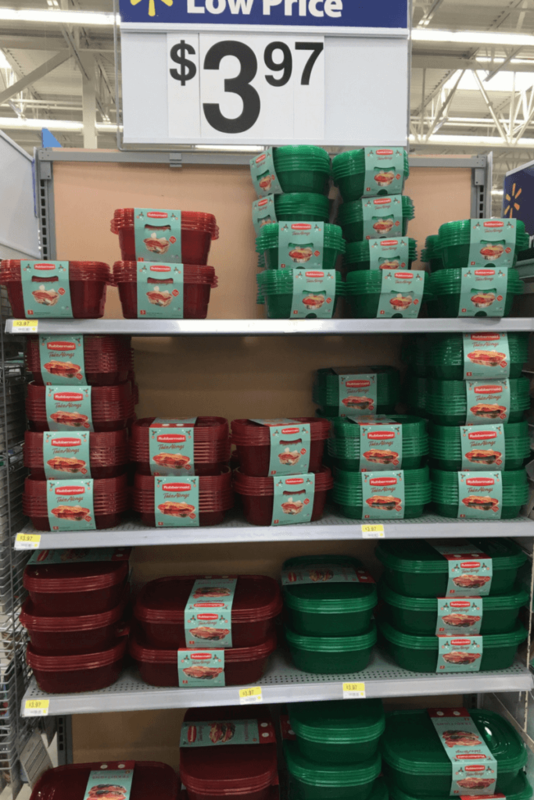 My local Walmart had a big selection of different sizes to choose from, so even if you intend on bringing a metaphorical ton of cookies, they have containers in that size. For this tutorial, I chose rectangular food storage containers in a deeper red and shallow green. I made sure to pick up plenty of containers so that I could continue to gift cookies to my friends and family all holiday season long! Next up, I gathered up my crafting materials. Since I hardly keep a stocked selection of craft materials, I picked these markers and brown craft paper up from Walmart as well. I happened to have the baker’s twine at home, though. I was also feeling extra festive, so I snipped a little branch off of a tree outside to use on this hostess gift. 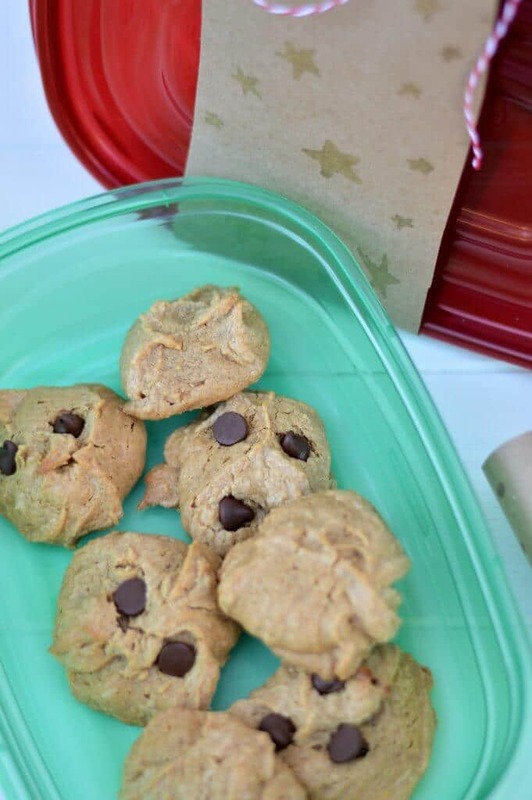 It’s also helpful to have some cookies or other festive holiday goodies ready to pack inside the Rubbermaid TakeAlongs. I made a quick and simple peanut butter and chocolate chip cookie. Pick your favorite cookies and stack as many as you can inside! I love that these containers have a big tab on the side for easy opening. Now, let’s get to crafting the perfect hostess gift. Once your cookies are all situated inside the TakeAlongs container and you’ve made sure the Quik Clik Seal™ has done its job, we can cut a strip of brown craft paper to go around the container. Choose a thickness that suits the size of the container you chose and make sure you can secure the paper edges with tape or glue. My paper strip here was about 3” thick and I trimmed the length down to go around the thicker red and thinner green containers. Though totally not necessary, a little hand drawn design can go a long way. I used my gold and rose gold markers to draw on a few designs that are both fun and elegant to dress up the otherwise plain piece of craft paper. Use your imagination! Once you’ve decorated the paper to your heart’s content, you can secure the paper together around your TakeAlongs container. I used tape, but a glue stick or hot glue would also work. Next, you’ll gather up your handy baker’s twine. Or regular twine, whichever you have on hand or prefer. Here I have red baker’s twine. Red twine just fit in with the holiday treat giving theme though, you know :). I only tied it twice around and looped it into a bow. If you’re feeling extra festive, don’t tie the twine just yet! My local craft store has an excellent selection of stamps and ink pads, so I picked up a few ink pads and this adorable stamp that I knew would come in handy for the holiday season (and because I am that person who bakes a lot.) I also picked up these small circular tags that fit the stamp just perfectly. To make your own cookie tag for the hostess gift, simply choose your favorite color ink, find a suitable stamp and tag that will accommodate the stamp and start creating your own holiday cookie gifting gift tags. Here I used a gold ink pad and gold sharpie to sign my name. Feed your twine through the tag and secure it in a bow. If you’re feeling extra festive (we were here) stick a small evergreen branch or candy cane underneath the twine. Now all you have to do is gift this beauty to your fabulous hostess! Are there any holiday traditions you love to do each year? 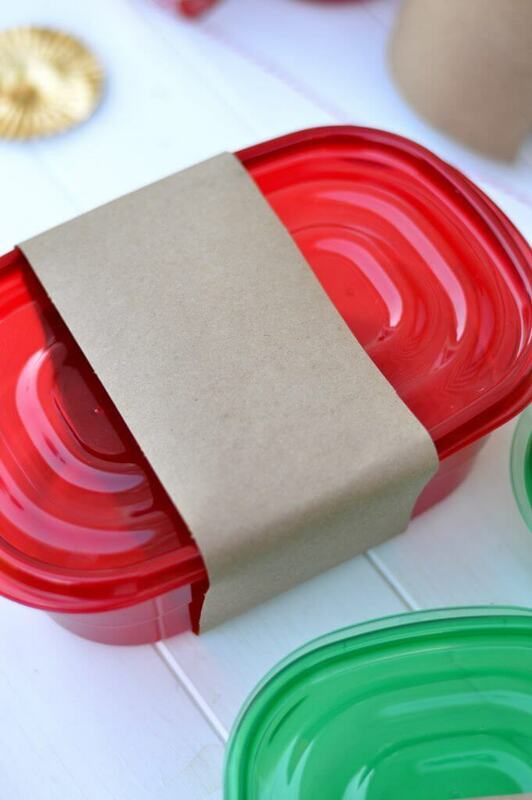 What would you make to put in these TakeAlongs containers? The holidays are coming, the holidays are coming! 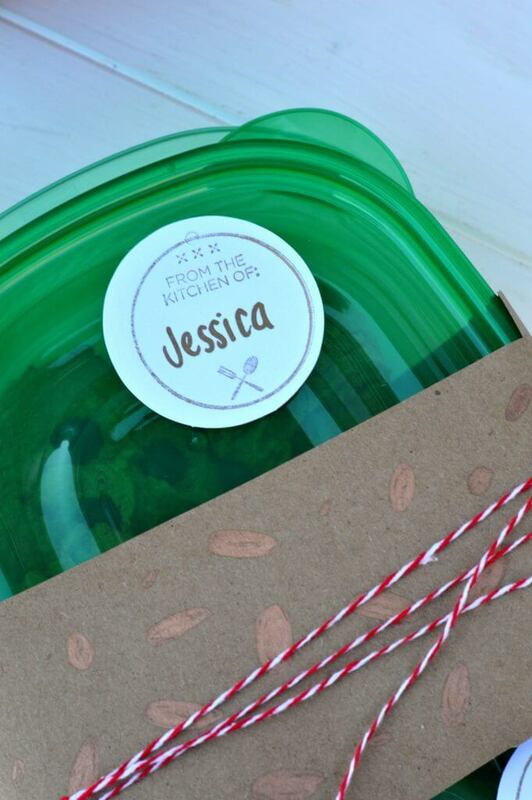 Don’t show up unprepared or without a proper hostess gift! 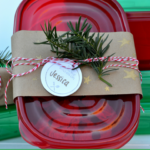 Fill container with an assortment of holiday cookies or treats. Close the lid to ensure a tight fit. Cut 3" strips of brown craft paper long enough to go around your TakeAlongs container. Using a marker, draw on any festive designs you'd like. Secure brown craft paper strip with tape or glue around the container. Tie striped baker's twine twice around the brown craft paper. 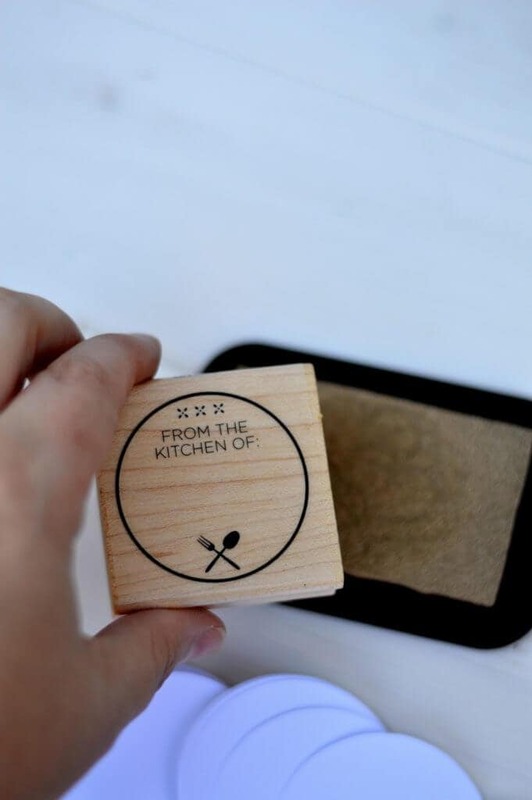 Prepare a custom gift tag by using plain tags, a stamp pad and festive stamper. Feed customized label through the baker's twine and tie the twine in a bow. 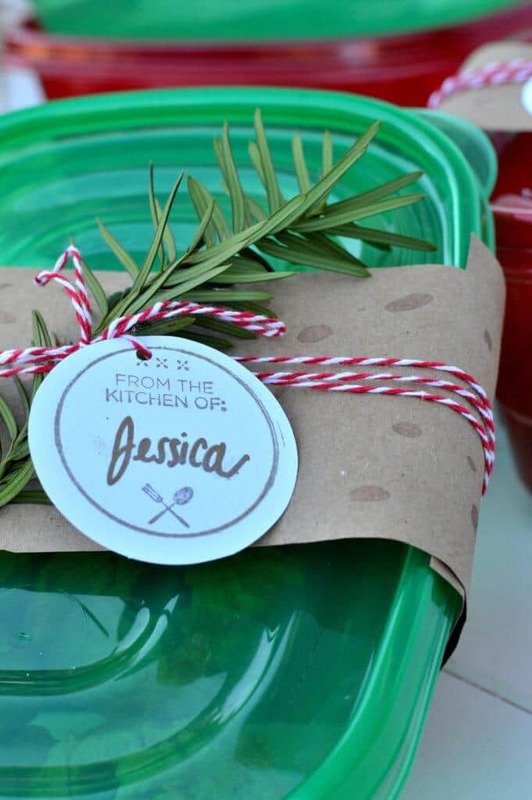 Tuck an evergreen branch or candy cane underneath the twine. Gift to friends, family, neighbors or coworkers. Everyone would love to receive a package of cookies like these! Pop on over here for more holiday inspiration! Oh my! I am loving your idea in making the cute but classy hostess gift!…and it inspire me too much! It’s simply easy to do by myself! You have reminded me of using the interesting food in my kitchen to give my darlings! Cookies are really the fabulous choice! Though, this style of gift, in my opinion, can apply to many of foods (of course, can be preserved for a certain time). Cannot wait to see how my darling be fancy when receiving these gift! Thank for you tip Jess! I love the whole look of this! I plan to give away a lot of fudge this year, so I have to remember this. Really nice “how to”, these containers class up nicely with the decorations and the cookies will be kept fresh! Take care. Thanks so much, Stacey. I can’t wait to gift these to my friends and coworkers! These look amazing, Jessica! I’m actually thinking these would be perfect for neighbor’s gifts this year. And the little bit of evergreen (rosemary!) stuck in the top is perfect. I bet you could also tie a Christmas tree ornament on there, too. Hmmm…my mind is whirring away with ideas for neighbor gifts now! Thanks for the inspiration! Thanks, David!! The possibilities are really endless and it looks like you spent a lot more time than you actually did on a little gift! I bet the ornament idea would be a hit! I am always gifting cookies to friends and family around the holidays. This is a much better idea than the usual paper plates and plastic wrap that I use!